. 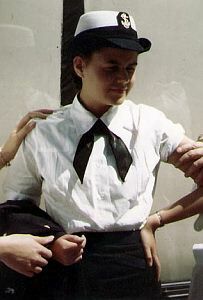 The Uniform Regulations, Women's Reserve, United States Naval Reserve, 1943 state the following about the material, pattern and wearing of the WAVES tie. a..Material - Shall be rayon, or silk, black or Reserve blue in color. .....1... General Style - Type I -- Shall be rectangular in shape, approximately 11 inches wide and 33 inches in length overall. 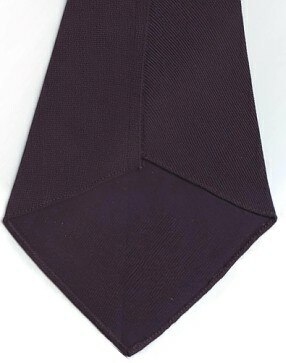 Type II shall be a two piece tie, approximately 13 3/4 inches long in each half, each piece to be identical. 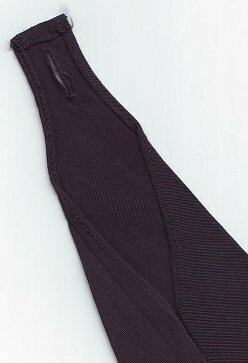 Each half shall have a buttonhole at the narrow end for securing the tie under the collar and shall be similar to the front half of a four-in-hand tie. .....2... Ends - Shall be cut in 90° angle points. .....3... Bias - Tie shall be cut on the bias. .....4... Edges - Edges shall be neatly hemmed with a 1/8 inch hem all around. .....5... Wearing - Type I tie shall be folded lengthwise and worn under collar of shirt with ends tied in a square knot. Type II tie shall be tied in a square knot and the narrow ends buttoned under the collar.
. 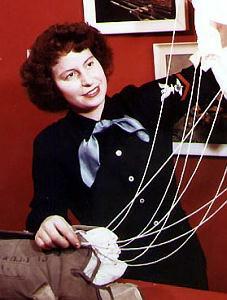 WAVES Tie - Type I . The original WAVES ties - Type I which I own are slightly different in size. I assume the size did also depend on the thickness of the neck of the former wearer - that's why the regulation state "approximately". I have WAVES ties measuring in length 33 inch, 34 inch and 35 inch. For the present pattern, I have taken the measurements of the tie with 34 inch length. 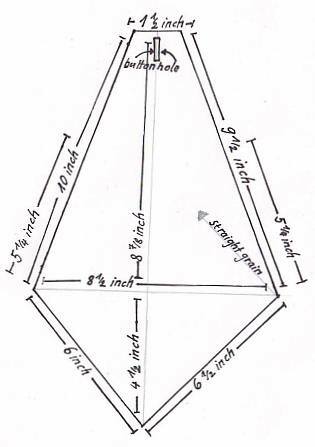 All measurements given here are without seam allowances!
. WAVES Tie - Type II . The four-in-hand type WAVES tie is a little bit more difficult to reproduce. The tie has to be sewn together at the two opposite long sides 5 1/4 inch as marked at the pattern below and a buttonhole has to be added at the narrow end. All measurements given here are without seam allowances! The advantage of this type of WAVES tie is that the knot doesn't have to be unfastened once it's been tied properly - the wearer simply removes the tie from the collar buttons. Detailed pictures of the back of the tie.